Learn the fascinating history of Cartagena’s Colonial Wall and Bastions with the aid of this independent audio guide tour, complete with sound effects and details from local historians. Follow 2.5 miles (4 kilometers) of the length of this defensive structure, learning about the military engineers who created the fortification and its role in protecting the city from cannon-laden enemy ships. There’s 22 distinct sections of audio in the guide, allowing you to explore at your own pace. 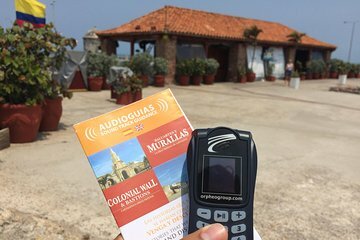 This Cartagena audio guide includes a headset and drop-off and pick-up of equipment at your hotel. I took this tour but it is too hot to walk around doing all the walls . We cannot finish it. Personal muy malo e irresponsable, llegué a las 9am al punto acordado, tomé fotografias y todo, y nadie apareció, les aconcejo conseguir personal responsable.